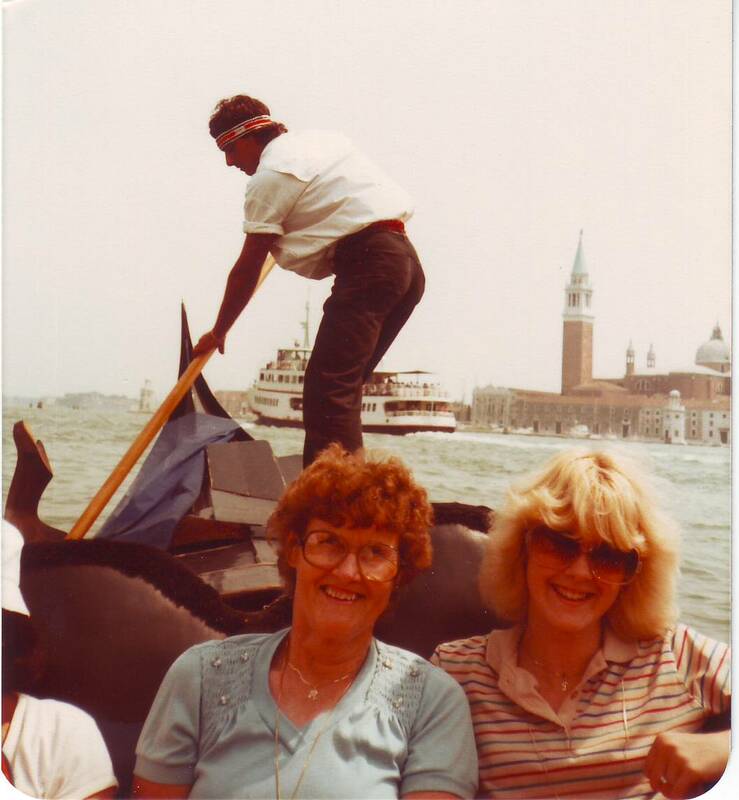 In Venice with my Grandma a LONG time ago. 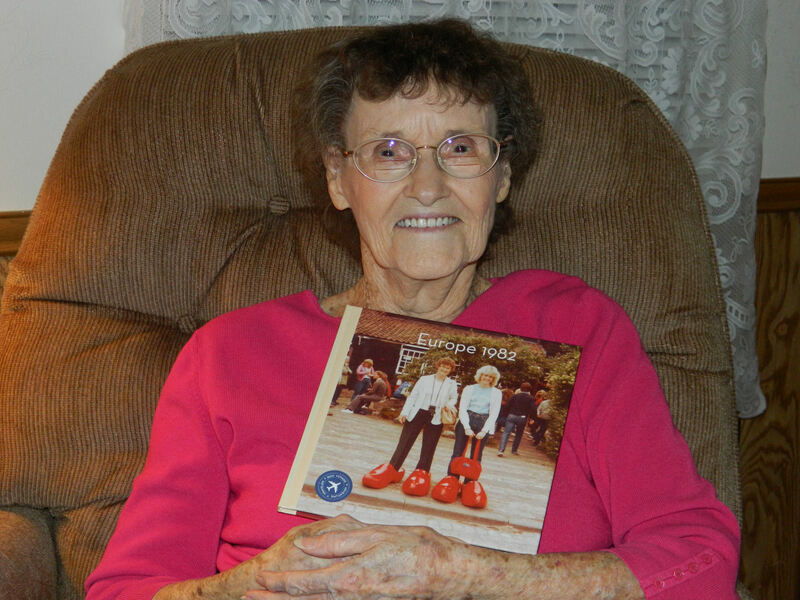 Today is my Grandmother’s 91st birthday (Happy birthday Grandma!) and this year, just like every year, reminds me of a past birthday of hers that we spent together during my first trip to Europe. I was just 16 when my grandparents announced their travel plans for the following summer, but I was determined to figure out a way to tag along. And after saving up part-time job wages, as well as money from garage sales and even collecting aluminum cans along the road, I did it! It was a 3-week super-saver bus tour of as much Europe as could possibly be squeezed in. We started in London and then hit up the Netherlands, Germany, Switzerland, Austria, Italy, Monaco, and France before heading back to London. Whew! We were rushed but to this enthralled 16-year-old, it was Heaven. 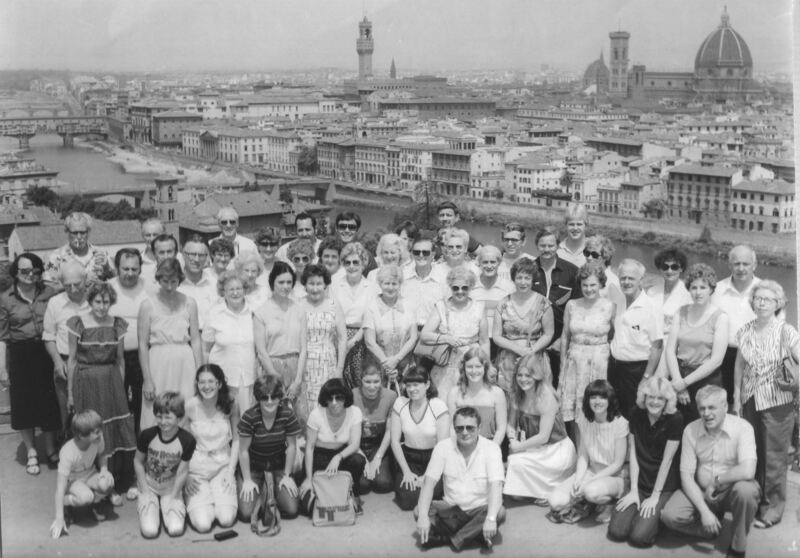 The whole tour group in Florence, Italy. On June 19 all those years ago, we stopped for the night in Innsbruck, Austria before heading to Salzburg. Our guide for the entire trip was a charming Italian man and when he heard that it was my Grandmother’s birthday, he followed me up to her hotel door. From out in the hallway, he serenaded her in English, Italian, and even a little German. I think we both swooned a little. The whole trip was packed with memorable moments, including breath-taking sites (such as a parade of costumed locals marching past the Leaning Tower of Pisa or the sheer grandness of Rome’s St. Peter’s Basilica) beautiful towns (Florence is still my most favorite place in the world), and lots and lots and lots of laughs. In fact, our trip began with the biggest laugh of all. Our first main city after London was Amsterdam, where we were taken to visit the sea-side village of Vollendam and to an interesting but oh-so-smelly cheese farm. After that we were told that we’d be going to a clock factory and that we might even want to get our pictures taken inside some of the giant clocks. Hmm… well, okay. We were up for anything and so Grandma and I began excitedly discussing (kind of loudly) the best way to pose with the clocks. But when we drove into the parking lot, we realized that discussion was worthless and we burst out laughing. Because we were in Holland, land of the wooden shoes, our guide had taken us to a CLOG factory. 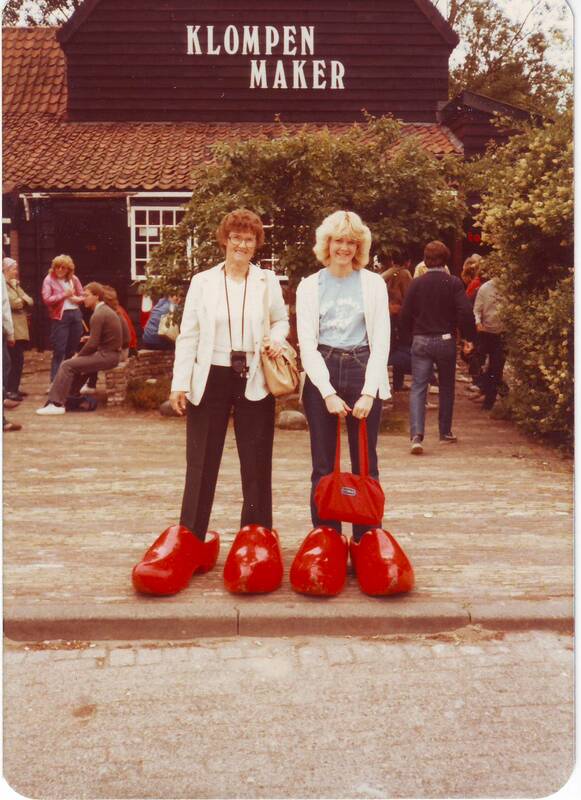 And there in front of the main building was a pair of large red CLOGS. As we jumped out of the bus, still laughing, the guide whispered that there weren’t going to be any large clocks there. Do we look a little embarrassed? Nah! I have always loved that story about the Clock/Clogs. This story will definitely live on for ever. 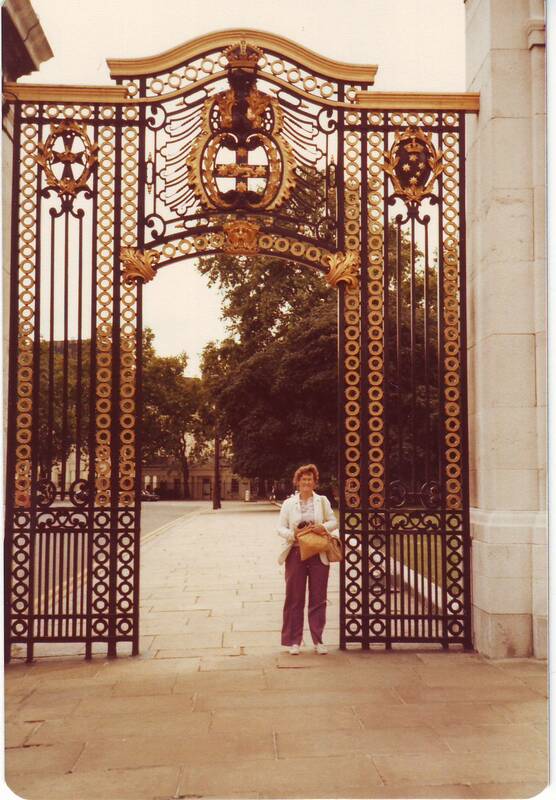 How lucky you are to have such a wonderful grandma to enjoy back then and still to this day.